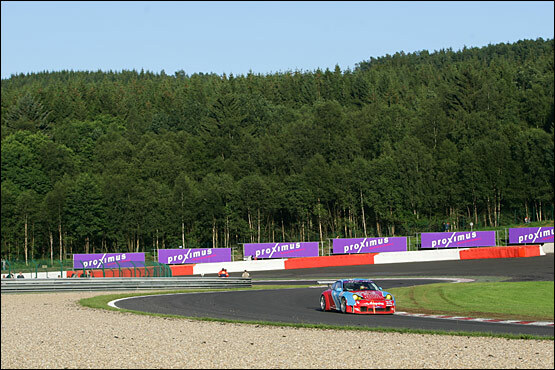 The Proximus 24 Hours of Spa presented by far the biggest racing challenge yet for the still young Embassy Racing team. 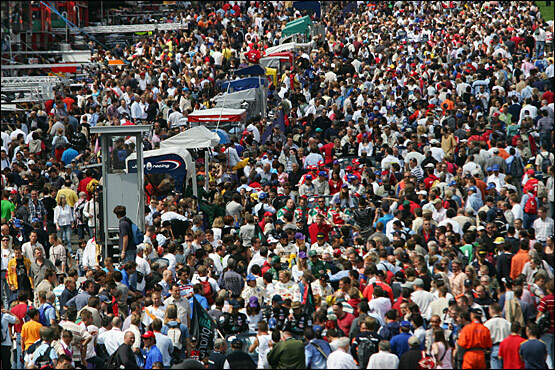 The swelling pride of the crew was there for all to see as the team lined up the #55 Porsche at Spa alongside the cream of Europe’s GT teams, fielding Aston Martins, Maseratis, Ferraris, Chevrolets and of course lots and lots of Porsches. Embassy Racing was looking to add to its podium at the Silverstone round of the FIA GT Championship with more silverware from the same championship here. 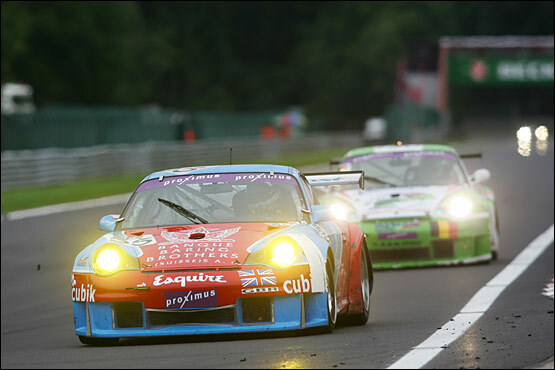 The team had added the well known driving abilities of Porsche factory star Sascha Maassen to the regular driving squad of Ben Collins and Neil Cunningham, in order to increase its chances of doing so. Sascha’s initial reaction - “I knew some of the guys already of course, but despite that I came to race with them anyway!” - showed he had not only the talent but also the sense of humour required to make the relationship tick. 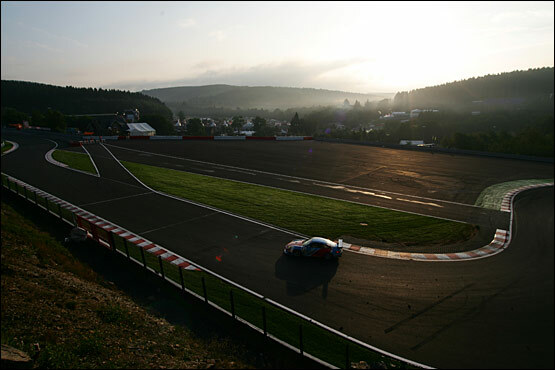 The talent was there in abundance, both behind the wheel and in the garage, but with 24 hours of hard racing at one of the world’s most demanding circuits, one other vital ingredient would be required – racing luck! The omens from the early part of the meeting were not good. The first qualifying session saw #55 well in touch with the lead GT2 group, despite being fitted with an engine that had already seen well over 30 hours worth of racing running. The plan was to change it for a fresh unit, fully rebuilt by the Porsche factory, in time to use the last qualifying session to establish the optimum race set-up. 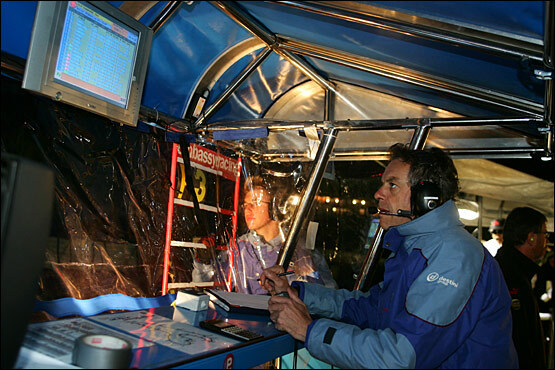 Good plan, but it seems someone up there decided that a team in its debut 24 hour race wasn’t going to have it easy! It was a blow, but far from fatal. 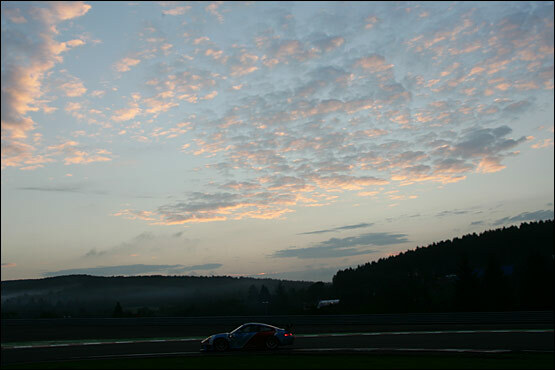 Race morning warm-up would see Sascha Maassen out for a brief, but valuable, 15 minutes in the Embassy Racing Porsche, the team making up for at least a little of the lost time. The marathon beckoned and Maassen had a clear view of the objective: “The car is fast and we are well up with the leading group in our class. Our goal is of course to finish the race and to finish it on the podium.” Sounds easy when you say it doesn’t it? 4pm and the pace car pulled off the circuit, but a heavy shower as the grid formed up had wreaked havoc with the tyre choice. 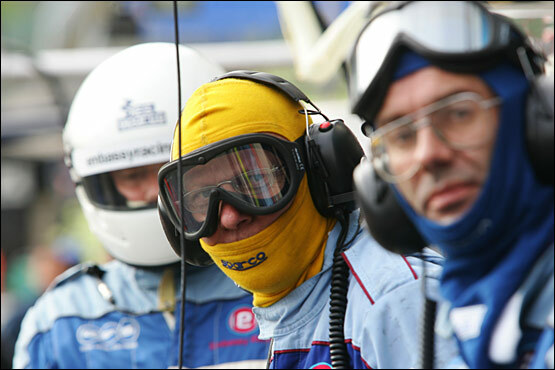 Embassy chose to start on wets, which looked initially to be the correct choice, but then cost them dearly as the cars which had risked taking intermediate rubber started to get up to speed. A change to slicks as the track began to dry, a choice matched by some of the most experienced teams in the race, proved to be the wrong call - as rain began to fall again almost immediately. 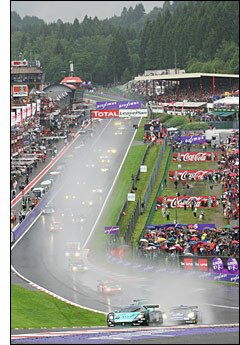 The first two hours proved a real trial, with the wets / slicks sequence repeated as the weather changed again and again. Slicks on a wet track is a lethal combination and the rapidly changing conditions finally caught out Sascha Maassen, the car skipping wide into the Blanchimont gravel, damaging the critical front splitter as it went. 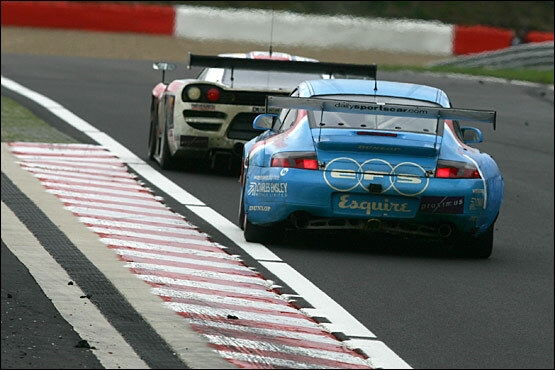 The #55 car was soon a full lap astray of the lead GT2 car. The crew effected as good a fix as they could, but it would cost the team the cutting edge from their pace for the remainder of the race. Ben Collins was next aboard and he too had a brief moment in the gravel, after an off on the still very greasy surface - definitely not his fault though. A more substantial delay though was caused by a broken half shaft – but despite racking up delays, #55 was still running third in class, well in the hunt for a podium: the other GT2 cars were almost all hitting trouble too. 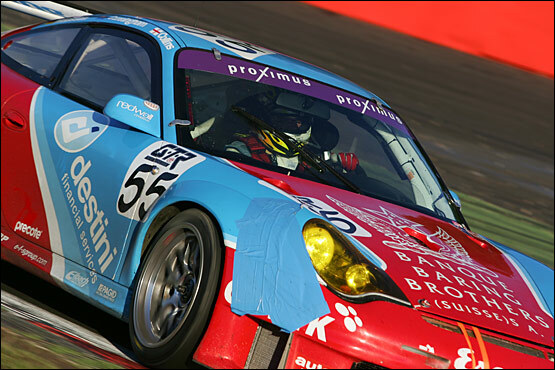 The second GruppeM Porsche was in particular trouble after being caught up (and heavily damaged) in somebody else’s accident. 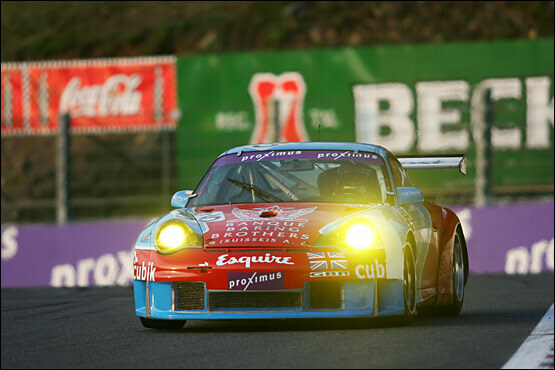 Neil Cunningham was the next to hit dramas, the Porsche hit in the right rear corner and requiring yet more tender loving care from the crew. This was already looking like a tough race to finish, let alone to score a podium. Back out and running, and despite the by now obvious damage, the #55 car was seemingly able to close effortlessly on most of the main class contenders. That was until another impact from a GT1 car at the same rear corner: this was becoming a cause of serious concern. 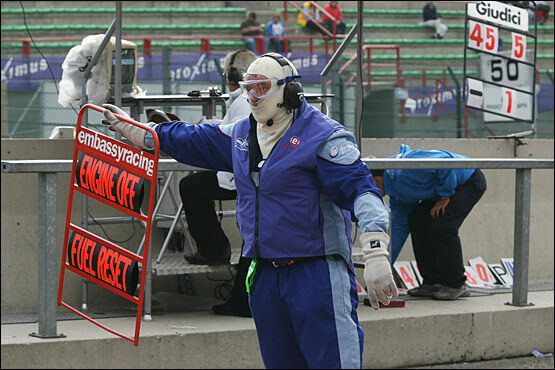 The car pitted for further attention but then rejoined once more, only to reappear in the pitlane again shortly afterwards: there was clearly something more seriously awry as the Dunlop tyre technician asked to examine the right rear slick. A good call, the tyre was showing a clear (and deep) groove, and the 911 GT3-RSR was pulled into the pit box for some rapid, and now not so tender, loving care. Having fought hard to get back into third in class, the position had now been ceded to the #69 Proton Porsche, Ben Collins rejoining a lap down. It wasn’t the last of the dramas either, the #55 car again falling foul of another car’s misfortune, this time the #191 G2 Porsche of Rudi Penders. The Embassy Porsche finally rejoined with Neil still at the wheel, all hope of a podium though seemed now gone, the repair costing the team a full 17 laps to the Proton Porsche. That racing luck had clearly gone elsewhere this weekend. There were tired faces lining the pit garage, and team members grabbing some precious sleep where they could, so shattered that even the cacophony of a GT car passing by the door at full chat didn’t disturb them. It was perhaps inevitable that somebody would mention the prospect of withdrawing the car - only to be drowned out by the crew! “We’ve not done this much graft just to park her,” said one bleary eyed spannerman. 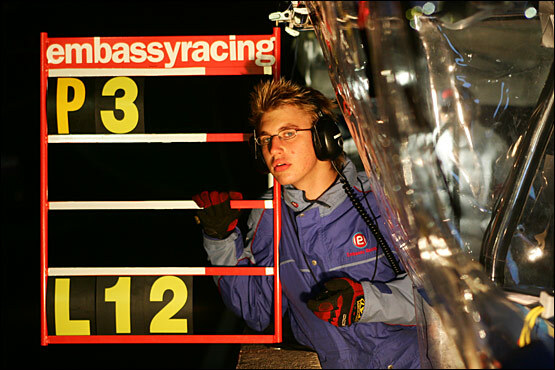 Embassy Racing had learnt one of the cardinal rules of 24 hour racing – you go for the win, or for a podium, but most of all you go for the finish. Incredibly the car was closing the gap again - still well out of reach, but with #55 lapping steadily, there was still hope that those ahead could stumble. 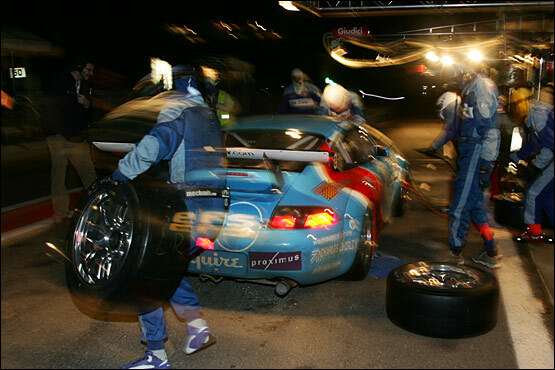 But the final blow to the team’s podium hopes were about to be dealt, the car pitting for a routine stop only to find the left rear wheel jammed on and the mechanics trying everything, including bouncing on the torque wrench, to fix it – it didn’t work, but the team now owned a very bent torque wrench. Worse still, Stephane Ortelli was closing all the time in the recovering #88 GruppeM Porsche, and eventually made the pass with the Embassy car still stationary, the repair taking just a lap too long - but in any case the GruppeM 911, despite its earlier woes, was by now in better shape than the #55 car and was able to pull away. It was time to get into “get to the finish” mode. And whilst fifth in class was a disappointment after the earlier highs, a finish in any team’s first attempt at a 24 Hour race is no mean feat, particularly if that race is as demanding as this one had proved to be. Last word goes to Ben Collins who summed up the effort beautifully: “It’s been a very tough race but the team has done a really fantastic job. We’ve been very unlucky with niggly, time-consuming problems, and particularly with having been hit at least twice in other people’s accidents, on the same corner of the car. That’s caused the guys no end of trouble, but they’ve fixed everything that we’ve thrown at them.